In my Systems Analysis and Design module in the first year at University I was put into a group and given this specification for designing a computer system. Even though it was a group project, I ended up completing almost all the work because of absences and lack of skills of the other members. 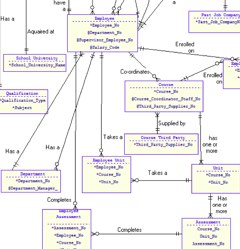 The project involved project planning, use-cases, multiple levels of abstraction of data flow diagrams, logic modelling, entity relationship diagrams at different stages of normalisation, and many other skills. This project taught me a lot about the systems development process and gave me a more formalised way of looking at potential projects. You can download the final portfolio here. For this project we were awarded 74% which is first class level. I am very pleased with this project and feel that without me the rest of the group would not have been able to meet such a high grade.